Sylvia Mythen of Venice, Fla., couldn’t believe her eyes. As double takes go, this one was a doozy. 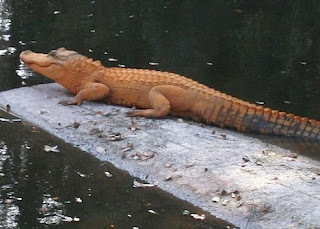 A biologist told Mythen that the orange gator is extremely rare. So rare in fact that he's never even seen one. Gary Morse from Florida Fish and Wildlife says, "The official opinion from our alligator experts is that this is alligator is not naturally orange. We believe it's orange from paint, stain, iron oxide or some other element in the environment that has left a coating on the animal, making it appear orange." We’ll vote for the anomaly. It’s just an orange alligator. Accept it. Thanks to TreeHugger.com for the tip.